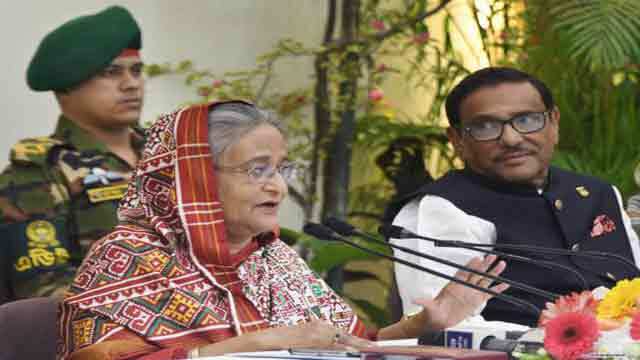 Dhaka, Feb 19 (Just News): Bangladesh Awami League (AL) president and prime minister Sheikh Hasina on Monday said newsmen don’t need to worry about the proposed digital security act if they don’t commit any crime. “You had wanted Section 57 [of ICT act] to be repealed. Dropping the Section 57, only those [provisions] which are enshrined in the CrPC [Code of Criminal Procedure] against various crimes have been included in the digital security act. Nothing else has been included,” Hasina told a press conference when a journalist drew her attention to the newsmen’s concern over the proposed law. The press conference was organised at her official Ganabhaban residence, originally to give the details about the outcome of her just-concluded visit to Italy and the Vatican City. “The confusion is whether the law will be misused. There was a provision in the CrPC of arresting the accused journalist immediately after filing a defamation suit, but we’ve amended that provision and included the provision of issuing summons first. “As we’ve amended that law, there is nothing for you to worry. And if none of you [newsmen] commit a crime, why will the law be misused? The law must be enforced if anyone commits a crime,” added the prime minister. The cabinet on 29 January approved in principle the draft of the Digital Security Bill, 2018. Shortly afterwards, rights activists, political analysts and newsmen, including the Editors' Council, voiced concerns over the proposed law, fearing that the law, if enacted, would create an atmosphere not congenial to independent journalism.